I like hosting little vegan parties in my backyard. I am a fan of finger foods and I am also a fan of comfort food. 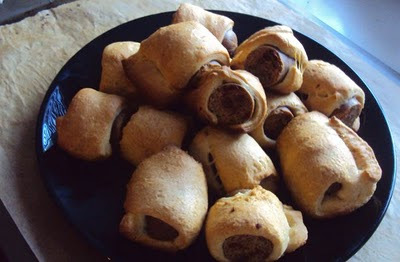 One of the easiest and yummiest things to create is Tofurkey Roll Ups or as many people call this dish Pig In A Blanket. Set your oven according to Pillsbury Crescent Roll instructions. Roll out the dough and flatten/connect the perforated edges so you get a sheet that is more uniform and will not divide. Cut the dough into 1 inch or so strips, you should get 16 strips. Set aside. Cut the Tofurkey links into 16 1 and a half inch (or so) pieces. Roll each Tofurkey piece in a piece of dough and set on a parchment paper lined cookie sheet. Bake for 10-12 minutes until the dough is a golden baked brown color. Serve with your favorite dipping sauce, mine is mustard!